“WHY? WHY? WHY? WHY DO I KEEP GETTING HIT? I’M SICK OF IT!” Tommy screamed from his bedroom. He was screeching about his Mario Kart game. I went upstairs to his bedroom and found him red-faced and glaring at his Nintendo 3DS. Still. It seemed that Tommy inherited my temper. Tommy hasn’t heard or seen an episode from us in over a year and I do not want him to behave like that when he loses so I warned him if I heard him yell again that I was taking away his Nintendo 3DS. I went upstairs and Tommy immediately burst into tears. I’d react the same way if someone tried to take my iPhone. He had to learn. So I took it anyway. “YOU ARE MEAN!” Tommy screeched. “THE WORST EVER!” He began banging his body against his mattress. This helps him calm down. I left as he did this and told him if he behaved he could have the game in a couple of hours. Ten minutes later Natalie came over to me. “Um,” she said. “Tommy said I hadded to give this to you.” She held up a piece of paper. “Had,” I corrected, taking the paper. “We don’t speak WalMart.” I peered down and my mouth dropped open. I rushed up the stairs and threw open his door. “What is the meaning of this?” I held up the paper dramatically. “What’s THIS?” I pointed at the YOUR. Tommy was at a loss for words. He gaped at me like a fish. Tommy raised an eyebrow. “I am sorry,” he muttered. He did behave the rest of the night and he did get his game returned. I’m pleased to say that he did not shout at it. And I’m pleased to say that I’m working incredibly hard on raising kids who have an understanding for basic grammar. “We don’t speak WalMart.” HAHA! Amazing! 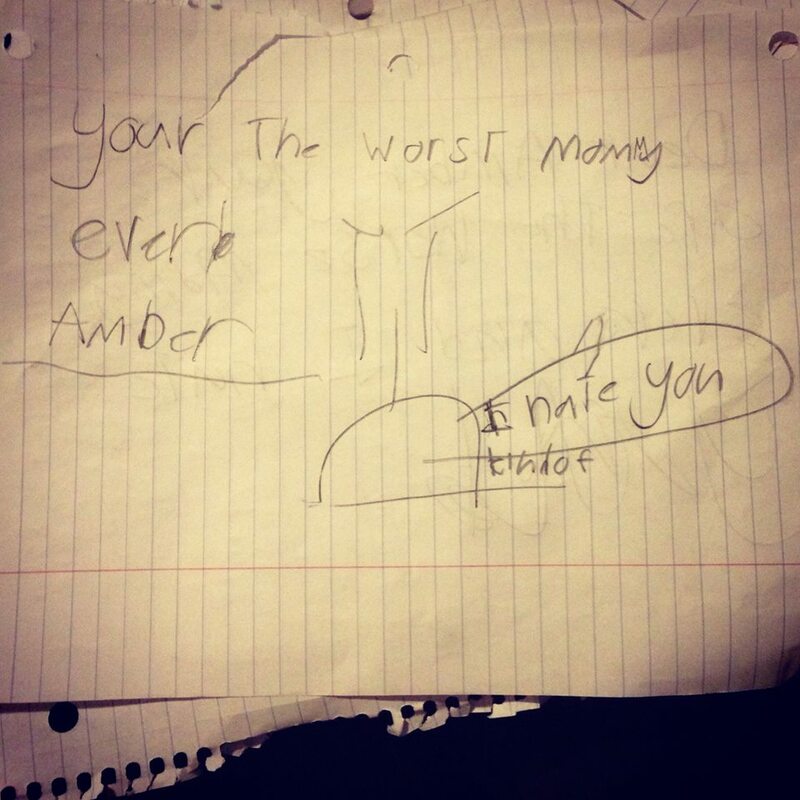 And instilling good grammar...even when writing a hate note...even more amazing. I want to be just like you when I'm a mom. We don't speak Wal-Mart ... that is freaking amazing! As a writing coach, I applaud your method of teaching Grammar rules. So inspiring. I loved your post. Followed you from SITS. Have a blessed day! LOVE!!! The whole "your" "you're" thing bugs the heck out of me too. And I had a good chuckle at "We don't speak Wal Mart"!! As a writer at work, my son's spelling drives me CRAZY. But I can't correct him because then we have an argument. grrrrrrrr. I love "we don't speak Wal-mart"! Too funny! Haha, that's one way to distract him. Oh dear - this made me laugh. Should it have? There should be more moms like this. I had such a bad "Nintendo Temper" that my mom walked in when I was like ten and I was swearing at my game with a string, of, "F***, S***, F*** S***." I didn't think I'd get addicted to games, but Candy Crush has got me crushed and I'll admit to saying some swear words! LOLOL Love it! I almost want to throatpunch my teen when he starts freaking over dying in Call of Duty. Get a grip dude! Also, we yell at video games, too :) Sounds like our house! I dunno, I think your a meeney. Omg this had me rolling. You are so hilarious! 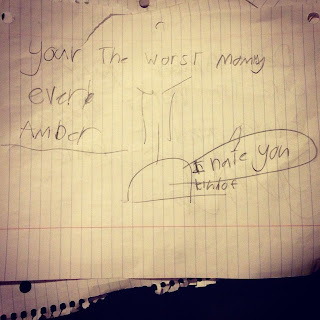 So funny, I wonder if he is going to remember that when he is an adult one day ... the day my mom got cross cause I used your i/o you're and not because I wrote a letter to say she is the worst mom ever. Awesome! Way to keep your eye on what's important!! I love that he said he hates you "kind of." Great story!! ahahaha!! Such interesting priorities. I also find the perspective of feeling like the game itself is cheating to be pretty hilarious--maybe it's a good thing I don't play computer games. I love that you got mad about the "your" and not what he said! Classic! I hope you be a great mom like you one day! Oh we have those melt downs on Super Mario - mind you the child I am referencing plays the same level, over and over and over and over and, well I guess you get the point...but as for spelling, I'm so with you on that! My kids are slowly learning that they need to get their grammar down or else! I am laughing out loud at this!! Gotta use the "speaking Walmart" line. You go grammar girl! Hahaha it sounds like you totally threw Tommy off guard, hilarious story! You are my kind of mommy! HAHAHAHA!!!! My son falls on the floor all the time....I know it feels good to him but OUCH! I'm so glad you focused on what was really important. All of his social media contacts for years to come will thank you. Or, the smart ones will. I thank you.